Why does the rifle have no bolt-handle-thingy? Is it one of them fully automatic bolt action assault weapons that MSNBC keeps telling me about? It’s obviously a left-handed model, with a special left-handed scope to, since there’s no windage knob on the right side of the scope. Its a left handed model that still ejects out of the right hand side? I didn’t know M.C. Escher designed rifles! I must be missing the part where it shows the round being ejected. Look at the picture. The ejection port is obviously cut on the right side of the gun. I knew you’d say something to that effect, butI wouldn’t say it obviously is. Most bolt action rifles do have a somewhat straight and raised receiver on the non-ejecting side, but not all. Take this Mauser, for instance: http://pictures.gunauction.com/1912728/10508177/1.jpg_thumbnail0.jpg. The receiver is cut out and machined in such a way that it looks like you’re looking at the left side of the bolt; even the stock is cut out the same way on both sides. 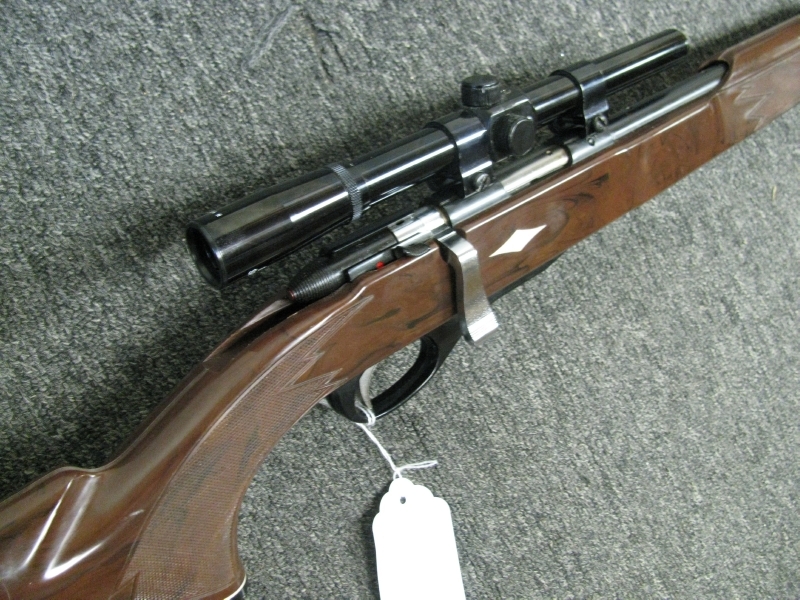 Here’s a picture of some custom-built contraption that appears to be symmetrical on both sides of the bolt: http://www.nicindustries.com/hunting_rifle_gallery.php?a=view&id=117. And I’m pretty sure that the rifle I learned to shoot on as a kid, although it was just a .22, was the same on both sides of the receiver. This is the best picture I could find of one, but it appears so from this picture: http://pictures.gunauction.com/623/img_7468.jpg_thumbnail0.jpg, and here is a picture of a similar model that lacks the plastic stock: http://www.thefirearmsforum.com/attachment.php?attachmentid=36503&d=1273795134. I’m sure there have been other rifles made where you can see the bolt from both sides of the firearm. All kind of a moot point though, because whoever made this obviously wasn’t real interested in accurately depicting the rifle, more interested in the overall concept of the sticker. Maybe it’s a new Californian hunting rifle model? Where the bolt has been removed to make the weapon “safer” and comply with new regulations. The windage nob has obviously been left off the scope to prevent republican gun-owners from assassinating police officers. And there’s no trigger, which prevents a hunter (or crazed, racist, teapartier, sadist) from making long-range, unfair deer kills. Instead, they’ll just have to use the rifle up close (i.e. as a make-shift club), so to make hunting a more “equal opportunity” sport for all species. That’s my argument. I’m stickin’ to it and no one can convince me otherwise. Republicans wouldn’t kill police. It would hinder their development of a police state through extensions to their Patriot Act. unless they upped their price since you posted, the cost is $10 for the sticker. Neat idea for someone else’s house. No way I’d put that gaudy thing up. What I’d like to see is a sticker for the OTHER side of the door with the rifle pointed the other direction. Or maybe a quarter-sized decal with cross hairs with a peep hole cut-out. ..Not that I’D put it on MY door. Sledge Hammer had a rifle scope mounted as his door peep.